Every Zambian accepts that as a nation we are suffering from the brain drain problem. A lot of our best young men and women are sadly abroad and are using their skills to aid already richer Governments. Zambia’s development story is one of filling a leaking bucket. The more we educate our youth, the more we leak these fine individuals to the global economy. The Government can try and ensure the pool of educated Zambians improve, but until we find ways of accommodating the leaks we won’t develop at the pace that we need to lift our people out of poverty. A number of solutions have been put forward to try and address this problem. They range from actively discouraging people by exposing them to the consequences of living abroad to more hard talk from Government. The President on one his tours to the UK once remarked that “people abroad are cowards”, simply as a way of trying to invoke that inner patriotism that would somehow get these individuals to go back and take up jobs at home. It’s clear that these approaches have not worked and cannot be expected to work. They are built on the wrong presuppositions of what drives the brain drain problem. People are not abroad due to lack of patriotism, the reason is purely economic. It comes down to incentives. At the individual level, we are all trying to do what is best for ourselves and our families. If we can get a better job (even any job) abroad to help feed our families and look after our people in the villages back home, why not? Secondly, some people are abroad because they cannot entrust their welfare and those of their families in the hands of the current Government. It is possible that the current uncertainty of our political institutions with respect to the rule of law, undefined constitutional rights, culminating in weak Governance makes it difficult for people who are used to express and work in an unhindered way to go back and reside in Zambia. 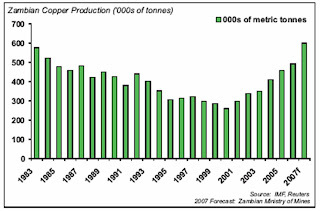 Finally, at the macro level, Zambia is a small ‘open’ economy in an increasingly interdependent world. Zambia like many other developing countries in the global pond surrounded by big fishes must accept that this is bound to happen as countries continue to compete for scarce resources. Having accepted this reality, and the impossibility of reversing or halting the trend in a global and interdependent world, the natural question is what can Government do to help cushion its impact? I believe the answer lies with finding ways of living with a leaking bucket. We cannot throw the bucket since it is our only one, we must finding ways of accommodating the leakage. A sort of the third way that focuses on tapping into the expertise that is outside Zambia without necessary asking people to come back home. How could this ‘third way’ work? Well lets take for example X who is a economist, if the Government asked X to go back today, he is more likely to refuse because the personal benefits to X being abroad outweigh his personal benefits being at home in Zed. In economics this is a type of a market failure problem since the private benefits to the individual or being abroad are less than the social benefits of him being in Zambia, generating a ‘suboptimal’ outcome for our Zambian society. But if they asked X to lend Government a month each year to offer advice, X would readily do that because the personal costs of doing are probably outweighed by the personal gains [personal gains include his feel good factor for helping his people etc]. The key condition here is that this action comes at very little cost to X (since X need not quit his job to help Zambia). If the Government could find ways of allowing X to engage in the process at the limited cost, he would probably do it. This is the same for doctors abroad and people in other fields. In my view, the Government needs to think of creative ways in which people can contribute to development without necessary asking them to move back. This could be through external forums, monthly programmes like above, or easing the way Zambians abroad invest back home. There's a lot the Government can do and should be doing to get around the brain drain problem. But the onus does not rest on Government only. It also rests on Zambians abroad. We need to start pushing Government to move towards this framework. A small network could clearly demonstrate to Government that its citizens are proactive and are thinking through issues. A recent suggestion put forward by a Zambian abroad is to use a model based on the South African Network of Skills (SANSA). SANSA aims to links skilled people living abroad, in various domains including academic, cultural and commercial, who wish to make a contribution to South Africa's economic and social development and connects them with local experts and projects. As that Zambian pointedly notes "I believe that the business case for developing nations like Zambia to build a framework such as SANSA is compelling. The financial muscle of nationals living and working away from home cannot be ignored or underestimated…..Zambians living abroad can impart knowledge gained from their vast exposure to the outside world. They can provide consulting services in technology, medicine, real estate and business. The Diaspora can relay its knowledge on what skills are pertinent in meeting today’s global employment needs, they can provide information on college scholarships, they can make available research papers, provide social commentary, promote tourism – the list is endless. In turn members of the Diaspora can be kept abreast with real time events and opportunities in Zambia; what bills are going through parliament, opportunities for investment and employment, social trends etc" . My question to Zambians abroad is – when are you going to do your bit to help our country live better with the leaking bucket ? When are you going to wake up and start lobbying Government to start thinking of creating such a framework? I strongly plead with you to reflect on these thoughts, and consider getting in touch with like minded Zambians to create such a framework. Let us start today, for we are the Guardians of today, not of tomorrow. "From Stability to Improved Service Delivery", was the theme of Magande’s latest budget. It does not take long to go through the budget to see that the Government seems to have found a new level of confidence in the area of macroeconomic management. From the positive announcement of the new Chinese economic zone to the praise of the continuing mining recovery, the budget oozes with confidence. 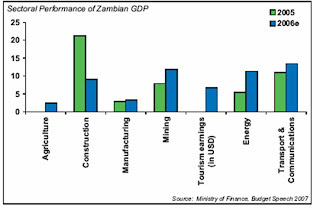 Two key areas particularly magnify this new found inner belief – the "7% GDP growth rate” projection for 2007, and the "5% inflation” target for 2007"
There's no doubt that Magande's has achieved broadbased macroeconomic stability as result of the fiscal reform that him and LPM continue to take forward, and not least aided by the debt relief and the overwelming advantage of the recent trends in commodity prices. Not only that, we know mining is expected to grow even more, while the Government continues to push for more diversification of the economy. But are those targets really achievable in 2007? A key question economists have been asking is, "how will the country cope with the appreciation of the Kwacha, driven by a flood of yield seeking portfolio flows in late 2006?" A closer inspection of the sectoral breakdown of the GDP provides more questions than it answers. While growth last year was high at 5.8%, the sectoral performance showed significant variability across the piece. Agriculture in particular only posited a 2.4% growth in 2006 despite a bumper harvest of 1.4m metric tonnes in 2005/6 season, probably held back by the fall in external competitiveness due to the dramatic appreciation of the Kwacha towards the last quarter of 2006.
to have been lasting. Its fair to say that the economy does appear to be primed for growth. So it is indeed possible that 7% can be achieved, all things being equal. The inflation target set out in the Budget may be more challenging to achieve. With yields on Government securities significantly lower than they were when the portfolio flows flooded in, inflation in 2007 will not benefit from a repeat performance of the currency's gains. In 2006, inflation also benefited from the impact on food prices of the bumper harvest. This will now contribute to a lower base, making y/y inflation difficult to control. The real test though, is likely to be the extent that inflation expectations have really changed, given events of recent years. Wage negotiations - which are traditionally around 20% - will thus provide a key test. There's however some positive signs on that front, with the Government this past week reaching a settlement with civil servants of about 4%. How other unions react will be crucial. The stock of domestic debt also increased 24.2% in 2006, to stand at 20.2% of GDP (from 19% previously). This largely reflected the securitisation of domestic arrears, including the debt owed to the Bank of Zambia. Similar growth is not expected in 2007, potentially removing a key source of support to yields. Much will also depend on the FX risks. Despite the receipt of large portfolio inflows (estimated at $149m in 2006), we do not appear significantly vulnerable to a sudden outflow of these funds. Last year, the we received $338m in FDI, and donor grants of $293m. Although these numbers could certainly decline, they still appear more than adequate to cover any potential portfolio outflows. Following Multilateral Debt Relief, our external debt has fallen dramatically, from $4.5bn at the end of 2005, to only $635mn by the end of last year. Debt service payments in 2007 will fall tenfold relative to pre- HIPC levels, to only $33.9mn. So, even with around two months of import cover, we are not hugely vulnerable. 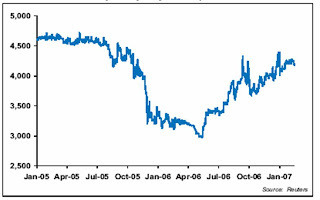 With a strong trade surplus still, most analysts agree that the balance of risks suggest only gradual depreciation of the Kwacha deprecation in 2007. Finally, Magande also announced that Government will be taking steps in the direction of boosting revenue from the mining sector. Proposals have been put forward to increase corporate tax in the mining sector from 25 to 30%. The standard 15% rate of withholding tax on dividends and interest is also likely to be reintroduced with respect to the mining sector. Finally, negotiations are underway to increase mineral royalties from 0.6% for base metals, and 2% for precious metals, to 3% overall. Although the Budget did not include much detail on when these measures are likely to take effect, given the continued favourable outlook for the sector, these are steps that we can afford to take. The long term implications regarding fiscal sustainability are therefore sound. A few uncertainities in 2007, but we have a cause for optimism on the macroeconomic front in the long term. There's further evidence on why our women are our long term hope for Zambia, in our drive to get out of the present doldrums. A recent report by the Global Health Council points to the clear benefits of empowering our women through education and having it central to any approach to social and economic development. There is an increasing widespread consensus that female education is a powerful factor not just for health but for the long term development of any nation, especially developing countries such as ours. When educated girls become mothers, they tend to have fewer children, provide better health care and nutrition for their children, and are more likely to send their children to school - boys and girls. Have better access to information and resources needed for good maternal and child nutrition. Girls' education is a powerful and sustained investment for health because it is a key step towards intergenerational transfer of improved prospects and improved health. Research consistently demonstrates that the more time girls spend in school, the better their chances of breaking the cycle of poverty and preparing the next generation to achieve better health outcomes. Greater civic participation and reduced instability, thus lowering the probability of the very negative effects of conflict on health. There's no doubt that if Zambia can invest more in girls' education we'll experience a dramatic improvement in the health and prosperity of present and future generations. Old debates about the best way to ensure girls' education have yielded to the recognition that many strategies work in varied contexts to get girls in school and keep them there. A recent analysis by Save the Children shows that political will and strategic investment are keys to success. In some respect it is good to see that the recent 2007 Budget reports an increase in growth in basic schools enrolment of 13.1% between 2005 and 2006. The sad news is that the same budget also shows that completion rates at basic school level in 2006 for girls is still low at 17.4%. We also know that statistics continue to show that the literacy levels for women are lower than men especially among the 15 & over. The case for action is therefore urgent. So what more can Government and interested Zambians do? First, we need clear and explicit goals by Government specifically focused on girls and female education. The current lack of explicit targets continue to be an handicap in our attempt to move forward as a nation. The Government needs to put women education as the top priority for the Education Ministry. Secondly, we must try and promote positive role models for our young girls - models that exude the beauty of our Zambian culture and at the same time embrace the importance of education and the need to be the best that you can be. Finally, Zambians abroad should do all they can to sponsor a girl child back home home. A small investment in a girl child could do a lot of wonders and reap the many benefits for our society that I have outlined above. The recent statement by the President when he arrived at Ndola Airport that he intends to call a gathering of mayors from around the country in a non-partisan way provides an opportunity to open the debate on the role of mayors and local councils in delivering development. A way must be found in which both the local councils and local citizens can hold each other mutually accountable in delivering development. Mayors can do much more than welcoming international leaders and milking election glories. Local citizens can do more than just elect mayors and councillors, and wait for another five years to make a difference. We have seen around the world, that where mayors have been given 'real responsibility' such as in Rio, London, and New York, they have been responsible for delivering effective policing, provided good and effective transportation and increased local economic growth. Equally local councils which have truly allowed participation from local citizens beyond simple voting of councillors, tend to generate greater and more locally focused development. They tend to meet the immediate needs of the local people in an extraordinary way. The key phrase is 'real responsibility' because it is at the very heart of effective local governance. Real responsibility entails the local citizens truly being involved in important decision making beyond simple local elections of councillors. A good model is one adopted in much of Brazil and is now being promoted by UN Habitat, called "Participatory Budgeting". To quote Ubitratan de Souza, the man responsible for the invention, Participatory budgeting is "a process of direct, voluntary and universal democracy, where people can debate and decide on public budgets and policy". In short local citizens' participation is not limited to the act of voting to elect local councillors, but citizens also decides on spending priorities and management of the local councils. We have seen that in Latin America, participatory budgeting has helped re-order social priorities and promote social justice. Local citizens go from being simple observers to protagonists in public administration. They become full, active, critical and demanding participants. The same thing can happen in Zambia, Participatory Budgeting can give local citizens in the poorest parts of our country better opportunities for access to works and services like sanitation, street paving, transportation improvements, and health and educational centres. By participating in the budgeting process, the local people would define their priorities, and in doing so have the chance to significantly improve their quality of life, in a relative short time frame. In addition, they have the possibility to control and monitor the execution of the budget. Participatory Budgeting goes beyond simple consultation, it would give local Zambians real power to decide how much to spend in their local areas. It would move the idea of development from the centre of Government to rural areas. My plea to the President as he meets the mayors around the country, is that he seriously consider shifting the power to local citizens in a real and vivid way, by giving them a greater say on how money is spent. Give them a seats on the tables of our councils down the land. If the Government is interested in holding local officials responsible and at the same time deepen local democracy, this is the best way to do it. Through Participatory Budgeting the little that we have as a nation will be better spent. The Zambian Economist does not censor comments based on political or ideological point of view. We only delete those comments that are abusive, off-topic, use excessive foul language, or include ad hominem attacks. This is a friendly website. However, if you feel compelled to comment 'anonymously', you are strongly encouraged to state your location so that other commentators/readers do not confuse your comments with other individuals also commenting anonymously. Of course, the easiest way is simply to adopt a unique nickname. Whenever a Zambian is cornered on what is needed to take the country forward, they tend to gravitate towards the 'dedicated fellow hypothesis' as the last resort. It goes something like this: "All Zambia needs to develop is dedicated and selfless fellows to take advantage of the huge funds that are available". I recently heard this during the 2006 elections campaigns, and am now hearing it again from the Zambian intellectual commune we dearly call FGOs (Future Government Officials) as they collectively ponder on how Zambia could leap forward in 2007. The central assumption in this 'dedicated fellow hypothesis' is that no matter how many good policies political parties promise, character is paramount to delivering development to Zambia. And since the Zambian political scene is dotted with individuals with the wrong motives, we are doomed to say the least. I must say I do have some sympathy to those that reach that conclusion! Our Zambian culture constantly emphasises the need for character and steadfastness, but that aside, in my view even if the hypothesis was correct, it suffers from two practical problems that renders it unworkable: First, how you find these 'selfless fellows'?. Secondly, and perhaps of crucial importance, how do you get them to be involved in development? Without answering these two fundamental questions, the 'dedicate fellow hypothesis' fails to sufficiently address how you get the best from the 'poor bunch'. I think we can all accept that Zambia has good selfless intelligent individuals (FGOs), the issue is how do you get these individuals involved? How do we make the good emerge from a large pool of the bad politicians? This is where the clarifying power of economics becomes so useful. Good economics as Professor Nicholas Stern once said is about "incentives" and "policies aimed at realigning those incentives". In my view there's a minimum level of policies that are necessary to aid the 'natural selection' of the 'good bunch' from a greater 'bad bunch'. However, this assumption immediately creates a paradox or vicious cycle - you need some initial institutional policies that encourage these selfless individuals to be involved who'll then deliver other development related policies, but to have the initial institutional policies you must have some selfless individuals who make them happen! I have no answer to this paradox but I would say we should concentrate our efforts on finding some initial institutional policies because it is a more objective target. We should initially focus on ensuring that the political institutions delivered the right incentives for selfless individuals to take part in politics. One way of doing this is to ensure that you have a strong constitution in place that is culturally self consistent, you create a proper economic consensus that is uniquely Zambian, and most importantly you find ways of engaging people with knowledge in a non-committal way. When you have the right policies that repair the political institutions, more or less the right individuals will emerge. A good political arena will have the right checks and balances and it won't matter whether a person is selfless or not. The system will ensure they delivered the right policies for the people. So my rallying call to the Zambian intellectual community is let's get the institutions sorted out (starting with a new constitution, organisations that taps into Zambian expertise abroad, etc) and everything will begin to fall into place. But obviously that very process is not so straightforward given the vicious circularity discussed above. Zambian development, what is missing? In Zambia we have spent a lot of time discussing how we develop in the long term and ensure we have a viable society. This is an issue I have been considering in the last three years. Yes the last three years I have spent time assessing how do we move forward? 1. What kind of development do we want to see in Zambia? And what do we mean by development? 2. What institutions do we want to put in place to develiver that development? The issue of chiefs is pertinent. We need to harness the role of chiefs and bring them back to the centre, preferable through enhancing the powers of the second chamber. But I also see them being more effective at local development. Crucially, we will need to bring them up to a level of literacy that would allow for them to engage properly in the debate. It is very sad that a debate on the role of our cultural institutions in development is not being adequately debated. This issue should be at the fore front. Aids : Should we spend more money on prevention or ARVs? The argument on this old question appears to have been settled. I recently read an article by David Canning entitled "on the economics of HIV/AIDS in low income countries: the case for prevention". [Journal of Economic Perspectives Summer 2006]. David argues that rather than spending more money on trying to heal aids patients with ARVs, poor countries like Zambia faced with the choice to either spend money on prevention through contraception and other things or spending more money on ARVs, should do more of the former, than the latter. He argues that we should spend more money on prevention instead of wasting it on ARVs, because we have so little money available to tackle the menace of AIDs. To support his argument, Canning carries a simple analysis based on data from 20 African countries including Zambia. He shows that prevention cost $859m managed to save 30.9 million lives, whilst ARVs costing $1,350m managed to save 2.4m lives. His argument is therefore that it is more cost effective to spend money on prevention through condoms and nutrition, campaigns etc, than treating AIDs patients with costly ARVs. I must say that I find Canning’s analysis highly persuasive - Zambia has few resources and money to waste: Shouldn’t our Government be listening, and start spending more money on prevention and stop people getting AIDs than on ARVs? The emphasis here is on “more”. No one doubts that there’s a role of some sort for ARV spending, but clearly MORE resources should be put into PREVENTION as it yields a better benefit cost ratio that on ARVs. I realise that this may not be a popular decision for any Government to make, but until Zambia starts making these bold and painful decisions we won’t make further progress. Unfortunately, this is another area where the recent 5th NDP is silent. It provides no information on the balance of spend. I think the Opposition Party owes it to the people to press Government to publish its plans on its future spending plans on prevention compared to ARVs, and to argue persuasively using economic evidence similar to the work by Canning, that there is indeed a need to 90%+ spending on prevention. We must not be held hostage by foreign interests who prefer us to waste money on ARVs because it keeps their Pharmaceuticals companies in business. An e-mail user group friend recently passed around the latest copy of the 5th National Development Plan. I was so excited to finally see the version of what the Government describes as a document " formulated after lengthy consultations to ensure representation from many people and subjection to accountability and transparency". Infact the Government has gone on record to say the 5th NDP is seeking "means of improving living standards of people and provide interactive ways of fostering development". - So does the NDP really do these things? I think this is important a simple google search revealved that this issue has not really been discussed extensively among Zambian Economists in diaspora. This is surprising given that the NDP would cost an estimated K62.6 billion to implement over a period of five years with K48 billion being sourced from the Government and K11.2 billion from cooperating partners.The remaining shortfall of K2.9 billion needed to be mobilised. Its therefor important that we know whether we are on the right plan/track or not. In that spirit, the moment I got to work, I quickly downloaded the 300+ pages of the document. Being a naturall enthusiast for infrastructure and health issues, I quickly found myself studying and reading the relevant chapters. To my horror and disbelief, the document turned to be one of the worst pieces of writing I have ever come across by a Government. To me a vision is well integrated. The 5th NDP isn't. No coherence whatsover.And the saddest thing is that with so many plethora of documents that Government's put out during the year, this should the most significant for a while. Unfortunately what we have, is a very weak document. For example on Aids, I was looking to hear how Government plan to balance the needs of ARV dependent patients and the need for prevention. There's nothing in there. There's nothing in this document, just numbers and useless figures.A summer student could have written it. We need a well thought and articulated vision of Zambia....Where all policy areas are connected. This is what a NDP was intended to do... I am sad to report, that in my view it has failed horribly! Simply put, we’ve already entered a situation where China has now raised the cost of Zambia reneging on her in the future. $800m is a lot of money, not to mention the money already China has pumped into the economy. 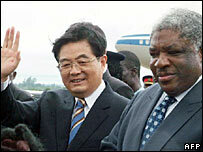 Zambia is ever increasingly becoming reliant on China. And to make it worse or better (depending on which side of the political spectrum you belong to), the current Government will keep pressing on for a deeper relationship with China. So we are indeed a poor peasant girl stuck with a rich lover with many wives, because China indeed has many wives and many children too! The growth between China and Africa has continued to rise - and not all the money is coming to the peasant girl, and indeed questions remain on whether China's current growth is sustainable. Zambians must recognise this fact and seek to address the next question – where to next? We cannot end the relationship, because with every gift we receive, we dig ourselves deeper into the hole. With that in mind, it becomes pointle ss for us to sit down and waste time analysing whether Mr Hu really loves us or whether he really cares about the peasant worker in a Chambishi area without medical insurance working in one of the Chinese firms. At the core China is a rational economic agent seeking to maximise its own gains from this unequal of relationships. What should really concern us now is simple: How can the peasant girl Zambia get along better with the rich lover that is China? She has done well so far using her limited resources of copper to keep this rich lover, but how far before the lover becomes abuseful, and starts exerting more control? Unfortunately, this is the difficult question our Government has now created, but has not yet been answered. Surely, Government owes it the people to do so, and to demonstrate that there's indeed in all her economic policies towards China, a Plan B. For now we live in fear of the day the lover becomes abuseful.